It may have been a summer or an early autumn day, back when the working class of Ireland all went on holiday in the first week of August, sometime during what I would later discover had come to be known as the New Age or Age of Aquarius elsewhere in the world. It’s not even a whole day but just an glimpse, a fragment in time, and most of it is all only connected to a few brief moments. The colour of it is a hazy yellow, as if seen through old gauze. It’s the particular colour that memory applies to sunshiny summer days in the distance of the past. There is no memory of wind. But is that because we can’t remember the gentle scalpel-edge of a mild breeze, or because it was preternaturally calm? The beach is in front, stretched out from the dunes far off in the distance around the large bay, to the nearby promenade, amusements and the hill above the actual town centre that we never saw and never thought of. The town was the beach, the amusements and arcades, the caravan-park and chip-shops. 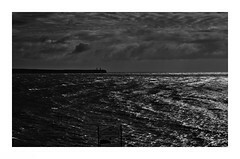 The sea was the molten reflective titanium of the Celtic Sea on a warm late-July day. The sun has paused high overhead, as it does in the early afternoon, and is laying down a broad electric reflective path from the horizon to the littoral. There may have been many people, but they are not present in this view. Somewhere near, is a woman with her two very young daughters and young fair-haired son. She sits upright, with difficulty, on a folding wood and striped canvas deck chair, of the kind the defies elegance and is so recognisable from children’s comics and seaside postcards. Beside her is an empty deck chair. She also has fair hair, cut short, and is wearing a light-coloured one-piece swimsuit with a cardigan over it. Her sight constantly switches between quick distracted glances at the children, and longer nervously twitchy gazes out to sea. You follow that gaze. On this very warm day there are quite a few people, that you now see, in the shallows. But since it’s such a long beach, the density of people is low, no Mediterranean crush. The tide is only about half way in or maybe out, so the water’s mutable edge is about a hundred yards away across the shallow gradient sand. People can be seen jumping up into the waist to chest high breakers. The wave train pushes in constantly and yet regularly, breaker, breaker, swell, swell, swell. From the dry sand to beyond the smooth and regular breakers is about another hundred yards. About fifty yards towards her right, out beyond the last breaker, where the swells are still intact, her vision searches. After a few seconds you think you see something and concentrate on a particular area. And there it is, someone swimming parallel to the shore, across the swells, performing the disappearing act of swimming along the faces of the waves as they pass underneath, rising and falling, as they metronomically disappear into the same place that magician’s assistants go when they climb into the box or behind the curtain. Each time it seems that he, because you know it’s a “he”, has climbed up along a wall of water too big not to bludgeon him, and fallen into a pit of invisible steel green which must have the power of a thousand Hoovers. Yet each time he reappears, almost in the same place, seeming to have made no headway, up beach or down, shoreward or outward. That’s it, that’s the glimpse. A pale shape, moving slowly yet not moving. But with a specific direction. Separated and apart. Breath-taking. Now you gaze longer and you still feel a slight nervousness at the swimmer’s situation. Yet also you feel the extravagance of his actions. Why is he doing it? Is he a champion swimmer or a champion show-off? Neither seems right or fit, to feel apposite to his actions. How will you know? Blink and draw a veil over your vision. Feel and hold that landscape. Now, impose a new view. Like a scene that viewed through a dirty glass seems distant and unrelated, when the glass is cleaned, you sink into and become part of it. Now you are part of the landscape. The swimmer is sluggish. He has been out here for about twenty minutes. It took effort to get out through the breakers. During the first five minutes he expended most of his energy. But now that he is out here he is reluctant to return to shore. He knows his wife will be anxious, yet he feels this at a distance, it’s a nagging concern but no more. He also feels strangely dissociated. Out here, he knows he’s a lone swimmer, out here. If this were the weekend and there were lifeguards on duty, he knows one of them would be futilely blowing a whistle from the water’s edge. But this is mid-week in the Ireland of the past, and the assumption is that people are only in trouble on sunny Saturday’s and Sunday afternoons, replete with Sunday Dinners and maybe sick from a touch too much of the sun. But here he is, sluggishly raising his arms and kicking his legs. He knows he’s not making any ground and then he smirks inside as he thinks the word “ground”. He doesn’t care. He just knows that so long as he appears to be swimming he’ll stave off the worst of the complaints when he returns. No, there are other reasons to be out here. Other thoughts. To “swim” up the face of the swell that seems to be about six-foot long is to feel like a different kind of human. In actuality to feel it push under him, widening him from the earth as the axe widens the crack in the logs for the winter fires. Squeezing under him the way the air was squeezed out from under the wallpaper in the two bedroom house he bought two years ago with the down-payment made from an unexpected loan from a maiden aunt. Inflation has given him an advantage in the payments over the last year, allowing this week-long caravan holiday, more than they had on their honeymoon after they had to elope. Elope. And they say this is a modern country now. How many of those, inwardly again he nods towards the people on the beach, how many of those even understand inflation, or care or would try? He does, he’s learned, taught himself, and is continuing to learn the way of numbers. Someday it might be useful, but for now it’s just sticking his tongue in the empty tooth-hole of his education, the opportunities foregone as child working to provide for a family, feeling the rawness and the gap. But this isn’t the type of thought that’s right, and out here, rightness is important. Out here the swells have a shape and a completeness. How few people have felt this? Feel the power of the intangibility, the permanence in motion of the water, spit the salt water, squint against the sun and eye-sting. Feel alive, feel the power and take it in. Make it you. Know that on a day like this, with the perfect smoothness and regularity of the swells, he can absorb the might of the ocean, take it in and become something new, something other, something powerful and more human. No need to worry about rocks or jellyfish, cramps or currents or mortgages or the trudge of a shopkeeper’s assistant job. So far from the rivers and swimming hollows of his childhood. He’s knows also that his time is short, that soon he’ll have to acknowledge the physical weariness and the cold and head in, allowing the breakers to wash him ashore, while he pretends to be in control, grabbing gasping breaths as the rushing waters spit him towards land, back towards the happiness, frustration and spider-web of the other fifty-one weeks. So for a few minutes he treads water, paddles lazily, and turns on his back, feeling a couple of last watery hands lifting him upwards into the cerulean arch of the sky, filling his ears with the alternating underwater rush and overwater roar of the breakers. Now it’s time. Turning towards the land, he starts an easy breaststroke. But even as he does he see something he’s never seen before. Piercing through the top of a breaker, towards the shore but near enough, a flat white shape, like the tip of a painter’s pallet knife he once saw on in Heidelberg when he toured Europe on his work bicycle, quickly followed by a head and torso. “Dressed?” in black. Almost instantaneously he recognises a rubber wetsuit, although only ever seen in the pictures & telly. The swimmer halts his swimming towards the shore, switching back to an energy-saving water-tread. This is new, someone else out here in the deep swell, but not a swimmer like himself. Quickly the sight disappears, seen as it is from the other side of the breakers, the wetsuit and knife are invisible much more than the swimmer when seen from the beach. So this must be a surfer, like in songs on the wireless. Again it appears, closer this time. Now he sees more. Through the wave the wetsuit wearer lies on top of the knife, the odd white board-thing, the surf board, and paddles down the backside of the wave, coming towards him, ‘till he disappears again. The swimmer waits, knowing his risk is now starting to increase beyond normal as he’s getting chilled, but is still not concerned. This must be seen, must be understood. The other person has passed the last of the breakers and is now into the swells. He can be seen for longer until he’s close, now in the next hollow, on the just-passed peak. Now he kicks, and sits up suddenly, sitting on the board, he stops moving, facing outwards. The swimmer is fascinated. The wetsuit and board are no more than ten yards away. The man in the wetsuit, for so it is again, seems to be about the swimmer’s age, although with wet dark hair and beard, the only thing the swimmer can say for sure is that the wearer isn’t very young. They are out here together. A slight upturn at edge of parted lips, the surfer nods inversely toward the swimmer, slightly jerking his chin and head upwards, opposite to the usual Irish nod. It seems to suggest something more than the usual, something different. The swimmer nods, as much as is possible, looks. An impossible recognition of his own has begun to form. Still facing outwards, the surfer on the board looks out to sea, evaluating, turns to shore, again seems to look for something, then fixes on whatever it is. Now he turns towards the swimmer. A glance over his left shoulder, he lies on the board and starts to paddle hard. The swell passes under the swimmer, piling upwards towards its tumultuous break, rushing the surfer forward. Now the wave has passed by from behind it is a long solid green lump, edged with a slight white foam. Above the wave rises the head and shoulders of the surfer, facing towards the beach, his arms also seen stretching out. He glides inwards with the wave, sinuously moving along and up and down, until he seems to disappear before the wave. The swimmer realises he must also finally head back. Resuming his easy breaststroke, he swims inwards until he too is caught in the grip of the breaking swell. For the next five minutes, between gasps and spluttering, he alternates between the short-lived power of swimming the top of the waves and the forward underwater suction of the bottom of the wave. He usually emerges to another urgent inhalation, before being grabbed again, until finally he can feel intermittent contact with raspy sand beneath his feet. He stumbles tiredly through chest high, then waist-high water, ‘till finally the changing level of the water isn’t enough to lift him any more and he can walk out of the water towards his family. Before he does he looks back out, through paddlers, splashers and shriekers. Is the surfer still out there, beyond the breakers? He walks up the beach towards his family. The fair-haired boy comes down. They walk back together, murmuring, the boy seeing the father in a different way. The man, the swimmer, the father grabs a towel and dries himself quickly, trying to warm up without letting him wife realise he is cold. The man has dark hair and grey eyes and a friendly open face. He would never be called handsome, but you would be glad of time spent in his company and later he becomes one of the essential rocks around which entire communities are built and thrive. He smiles at his family, murmuring quiet confident assurances against the worried words of his wife. No, no need to worry, It was fine. No, the waves weren’t too big. No, it wasn’t too cold out there. He sits and pulls on a sleeveless vest, then a short-sleeved shirt. Later they will have chips back in the caravan. The swimmer’s gaze is the one now focused outwards. There is no surfer. The swimmer out there now is different. There is less to understand, and more. The man looks at his family. His wife smiles at him again. His son looks at him. Does the boy see the father? Does the father see the boy? The swimmer looks back out to sea. There is no surfer. There is no swimmer. The universe has reached out and collapsed. There is no memory, no wave-function, only horizon. My chin jerks upwards, my eyes water and my memory is yellow and hazy. I store the smiling swimming man, the nervous woman and the two little girls in the ambergris of my heart. Pounding out bad 200s in the pool, I fill my goggles and underwater I hear myself roar. Unable to continue and hanging off the end of the pool, light reflects off the water onto the wall in front of me. I watch the cycling oscilloscope ghost pattern, and a question arises that has never previously occurred to me. Has water become the eyes and arms of my father? On the almost-anniversary of my father’s death, and my almost-Channelversary, this is a (re-)post (and edit) from back in the first couple of months of this site, when few people read this site. The first draft of this was written over five years before that, more than 10 years ago now, when I was still trying to cope with his loss and the only way I could try to do so was to bend time and reality. LS– I haven’t stopped thinking about post this since I first read it a few weeks ago. I, too, was introduced to open water swimming by my father, my vantage point always the beach. Many times I’ve wished to go back to that beach and eyeball how far the buoys he swam to really were. Life seems to be measured by different units when you’re a kid. Beautiful post. Cheers. Thank you. Feedback on the posts to which I feel particularly in emotionally attached is very appreciated. Thanks for that Conor. Most of the personal posts that I work hardest at seem to drop into a void when publish them, so I appreciate feedback om them the most. A brilliant piece, Donal. So evocative. What beautiful writing! 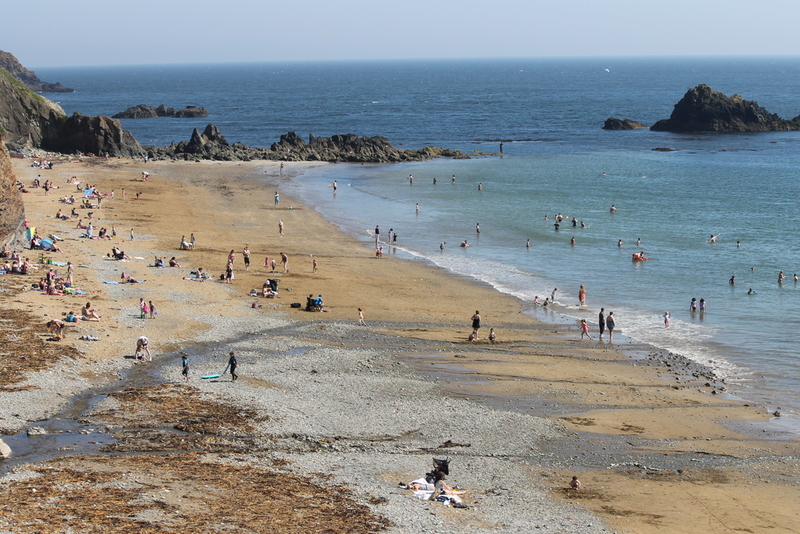 I am just cranking up my resolve to start my lone summer swims near Ballycotton..I need to get out there right now, this evening. I want that feeling of resting on and negotiating with the fathomless abyss…but I have to force myself through a lot of resistance. This post helps me with that…thank you. Hi Donal really like this one. Reminds me of Andy Irvines song ‘The West Coast of Clare’. Hope you are keeping well. Hey Sam, thanks. I was was just thinking of you yesterday and wondering if we are going to go for a swim this summer? Donal every time I think about returning I think about water. It may be a while before I make it down though. Please keep a space for me when I do, preferably with some decent groundswell. Thank you Bernard, I always appreciate feedback on my more personal posts, because they take a lot more work and effort, and mean more to me than any How To about some aspect of swimming.